Organic cotton in the U.S. This page is still under contruction! Please come back in a few weeks! Organic cotton is grown without pesticides and insecticides, furthermore organic cotton seeds are not genetically modified. For organic cotton cultivation only methods and materials that have a low impact on the environment are used (organic farming). Though organic cotton farming replenish and maintain soil fertility. Organic cotton cultivation reduce the use of toxic and persistent pesticides and fertilizers and build biologically diverse agriculture. Also farmers of organic cotton and their families profit, because water remains clean and less deseases and toxication appears form organic cotton farming. By that, Organic cotton agriculture protects the health of people. It also protects the planet by reducing the overall exposure to toxic chemicals from synthetic pesticides. These can end up in the ground, air, water and food supply, and are associated with health consequences, from asthma to cancer. Organic cotton agriculture abdicates form toxic and persistent pesticides, choosing organic cotton products is the easiest way to protect yourself and your skin. o High levels of agrochemicals are used in the production of non-organic cotton: according to the "Pesticide Action Network" cotton uses 25% of the world's insecticides and more than 10% of all pesticides - the cultivation of cotton accounts for only 2.4% of agriculturally used areas. Thus cotton production uses more chemicals per unit area than any other crop. o Many of these plant protection products are highly effective neurotoxins, having been used as chemical weapons in the past. o The chemicals used in the processing of non-organic cotton pollute air, surface waters and people. o Around 70 field workers are dying every day as the result of pesticides and insecticides application, the majority are children under the age of 14, additional 80 factory workers die every day because pesticide soaked cotton and fabric pollutes the air in warehouses and working areas (according to estimations of the WHO). o According to estimations 450,000 children under the age of 14 work every day at Indian cotton farms in debt slavery and free of charge. o Since 1998 alone in India 40.000 farmers committing suicide, trying to escape their debts encurred at biotechnology companies. o Massive human rights violations are commonplace: confinement of textile workers in the dorm rooms after 10 p.m.,as well as corporal punishment and abuse. o Still the consumer suffers from chemicals in garments since non-organic cotton textiles irritate consumers' skin, as they can also cause neurodermatitis (chemical residues stay verifiable even in the ready-made garment). o In Organic cotton cultivation only organic herb mixtures, crop rotation and natural enemies are used in fighting pests. o Consumers of organic cotton textiles are safe from skin irritations. Where is organic cotton grown? The first organic cotton project started 1990 in Egypt. Today organic cotton is grown in over 22 countries: p.ex. Benin, Burkina Faso and Mali. As of 2007 the largest producers of organic cotton are Turkey and India. According to "Organic Exchange" China, Syria, Peru, Uganda, Tanzania, Isreal, the United States and Pakistan are under the top ten organic cotton producing countries in the world. 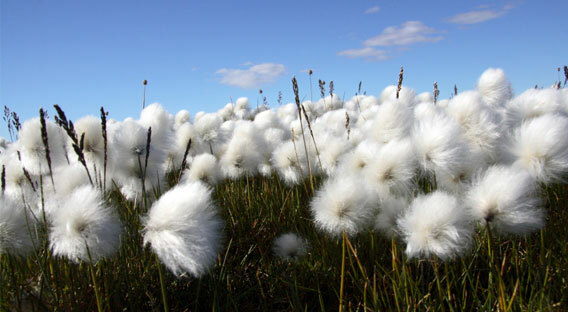 How is the textile industry involved in organic cotton? - In organic cotton manufactoring no organic halogens, no azo-dyestuffs, no chlorine bleaching, no formaldehyde..., are allowed and integrated sewage plant are mandatory. - Organic cotton manufactoring is controlled through independent and unannounced inspections, with access to all production areas. - Workers of organic cotton textiles have the possibility to address the certifying agencies through preprinted forms without knowledge of their supervisors.